The 1972 Spotmatic IIa was among the last of the Pentax screw mounts, made especially for the American market. Screw mount Pentaxes have long been popular with those who appreciate small size, sharp optics, well made craftsmanship, and a lot of camera for the money. 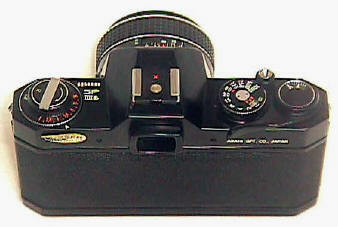 The IIa was basically an "improved" version of the 1971 Spotmatic II, with a special body sensor for automatic flash operation with the Honeywell Strobonar. Strobonar?? During the early 70's it was the leading electronic flash unit. 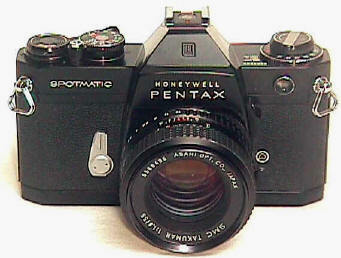 Big surprise: Honeywell was the American distributor of Pentax at the time. Unfortunately for Honeywell, the idea was not especially popular. Even in the US, the IIa is not common. Outside the US, it is very difficult to find. The IIa made a nice package for its day with well laid out convenient controls, mechanical 1 to 1/1000th shutter speed range, nifty hot shoe, microprism focusing, and TTL metering. Perhaps the most important thing is that the IIa, was very well made with sharp optics and great handling -- like all Pentax screw mounts. It is nice camera to use, even today. Perhaps the most troubling thing is the IIa's stop down metering. To take a meter reading, the lens must be closed down to the shooting aperture, which makes for a darker, hard to see finder. The example pictured here has a beautiful mint black enamel finish, with factory 55/1.8 SMC Takumar. It's really too bad today's camera manufacturer's don't return to black enamel. oh well. For more info, you can find a lot of Pentax collector sites on the web. Strangely enough, the famous ubiquitous 42mm Pentax Screw mount wasn't really Pentax at all. It was first used on the East German made Zeiss Contax S of 1949.